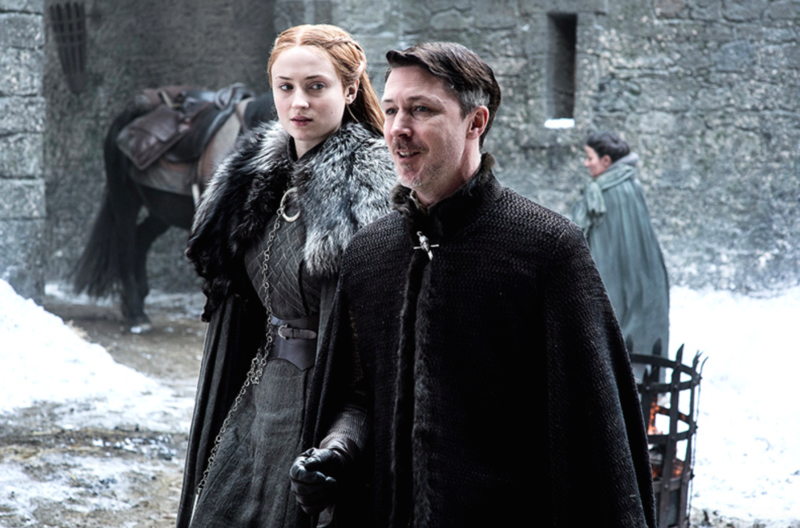 New photos from the upcoming season of Game of Thrones were just released on HBO’s The Making of Game of Thrones website, and it looks like Sansa has had enough of Littlefinger. Last season, Sansa finally reunited with one of her siblings (Jon Snow), killed her depraved husband (Ramsay Bolton), and restored the Stark lordship over Winterfell (yay!). But somehow, everyone’s least favorite master manipulator, Petyr Baelish, aka Littlefinger, is *still* managing to weasel about and we are NOT about it. Littlefinger, who is literally somehow behind every bad thing that happens on this show is still trying to manipulate Sansa into doing his bidding — but it looks like she’s done giving him the time of day. Just LOOK at the side eye she’s throwing at him. Sansa Stark, Lady of Winterfell, Queen of Shade. We all know Littlefinger is smarmy for a million reasons, but when it comes to Sansa, the former Master of Coin has always erred on the side of downright creepy. Under the guise of looking out for her best interests — he *was* in love with her mother, Catelyn, after all — Littlefinger has always used Sansa as his most valuable pawn. While Sansa has made a remarkable transformation throughout the last few seasons — from naive teen to ruthless player in the Game — the dynamic between Littlefinger and Sansa has always been seriously unsettling. Even now that she’s reunited with Jon, Littlefinger is still trying to plant a seed of doubt about Jon’s place as King in the North. We already know he’s looking to make a play for the Iron Throne and wants Sansa along as his queen. Gross, right? Sorry, but we’re in serious need of a Stark reunion and we cannot have Littlefinger ruining this for us. It’s time for him to go. Now that Winter is here and everyone’s preparing for battle, it seems that Littlefinger’s days could *finally* be numbered. For six seasons, Littlefinger has been the conniving prick who somehow gets away with every nefarious plan, so maybe it’s time for him to finally get his comeuppance. Cross your fingers, and hope that Sansa and Jon might finally get rid of Littlefinger when Game of Thrones returns to HBO on July 16th!